"AMLO versus Bolso": this is not the poster of a boxing match, or of a “lucha libre” one, but the promise of the confrontation between the two radically opposed visions of the future presidents of the two most important nations of Latin America. Andrés Manuel López Obrador, better known as AMLO, will take office at Mexico City's Zócalo on December 1, while President-elect Jair Bolsonaro will do so a month later, on January 1, 2019. The differences between the two are profound, in terms of their origins, political trajectories, ideologies, and styles. But in these turbulent times of absolute failure of Latin American states, the main battleground will be that of economic proposals, in two countries that are world champions of inequality. The far-right Bolsonaro has already stated that he is going to reduce the number of ministries and "extinguish and privatize" a large part of the public companies, an announcement that provoked euphoria all over the financial markets. He also wants to lower Brazil’s corporate income tax, currently between 24% and 34%, to a flatrate of 20%. The former army captain's team justifies this decision by referring to Donald Trump's tax reform in the U.S., which reduced corporate taxes from 35% to 21%. To be competitive on the foreign market and attract foreign investors, Brazil would have to join this race to the bottom. This is nothing new in the region. In Latin America, one of the main shortcomings of development strategies has been the widespread granting of tax incentives with the idea that they are essential to ensure investment, innovation, and quality jobs. However, surveys show that, for real direct investors, factors such as quality of infrastructure, a healthy and skilled workforce, market access and political stability matter much more. On the other hand, the reduction in tax revenues resulting from cutting corporate income tax has devastating consequences. Brazil could lose 9 billion dollars with this measure. This translates into a lack of resources for education, health care, poverty reduction programs, and infrastructure. It would be a new blow to the financing of social policies since the adoption, at the end of 2016, of a constitutional amendment that freezes public spending for a decade. Just last year, combined federal spending on health and education already fell by 3.1% in real terms. Reducing corporate taxes and diminishing public investment is not a path to development.Less funding for social programs also means less growth in a country where a large proportion of private capital prefers financial income to direct investment. The Brazilian Institute of Applied Economic Survey (Ipea) calculates, for example, that each time the government spends R$1 on public education, it contributes R$1.85 to its gross domestic product. The same value invested in health care contributes R $ 1.70. These are multiplier effects that cannot be ruled out in a country stagnating in an economic recession since 2014, and where the number of people in extreme poverty (living on less than $1.90 a day) reached 14.8 million in 2017. In reality, lowering the corporate income tax rate is nothing more than a gift to high-income businesses and individuals, with profound consequences for income distribution. In fact, those who hold shares and receive dividends for the higher profits obtained are the owners of the capital. Moreover, the erosion of tax bases is exacerbated by the aggressive strategies of multinationals, which manipulate transactions between subsidiaries, ensuring that profits are taxed in countries where taxes are lower and not where economic activity and value creation actually take place. That is why the Independent Commission for Corporate Tax Reform (ICRICT), of which I am a member, argues that there is an urgent need to reform the global tax system. A multinational must pay taxes as a single company doing business across borders. Global profits and associated taxes could then be allocated according to factors such as sales, employment and the resources used by the company in each country, reflecting its true economic activity. We also believe that countries should adopt a minimum effective tax on corporate profits of between 20 and 25%. This means dismantling the generalized subsidies and exemptions that prevail throughout Latin America; reducing corporate taxes and diminishing public investment is not a path to development. If Bolsonaro's Brazil does not want to participate in this debate at the moment, AMLO's Mexico has a historic opportunity to do so. In addition, it has more room to maneuver: its overall tax rate (20% in 2017 against 35% in Brazil) is among the lowest in the world. This situation would allow AMLO to increase government revenues by truly taxing the activities of companies active in Mexico. The challenges are not minor in Mexico, where poverty and violence continue to fuel the brain and arm drain to the north and where social mobility is almost non-existent. Only 4.5% of Mexicans between the ages of 25 and 64 whose mother or father only had primary education, finished their studies with a bachelor's degree. A situation that will not change without massive - and efficient - public investment. 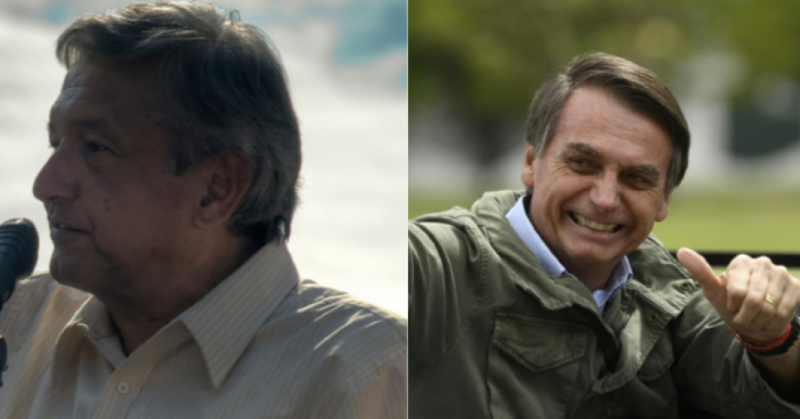 Jair Bolsonaro seems to have chosen the wrong path for his country. We hope that Mexico will opt for a development alternative that, instead, works towards strengthen the tax system while recovering the path of budget balance, public investment and, inclusive growth. Ricardo Martner is a member of the Independent Commission for the Reform of International Corporate Taxation (ICRICT). Previously, he served as head of the Fiscal Affairs Unit of the Economic Commission for Latin America and the Caribbean (ECLAC).